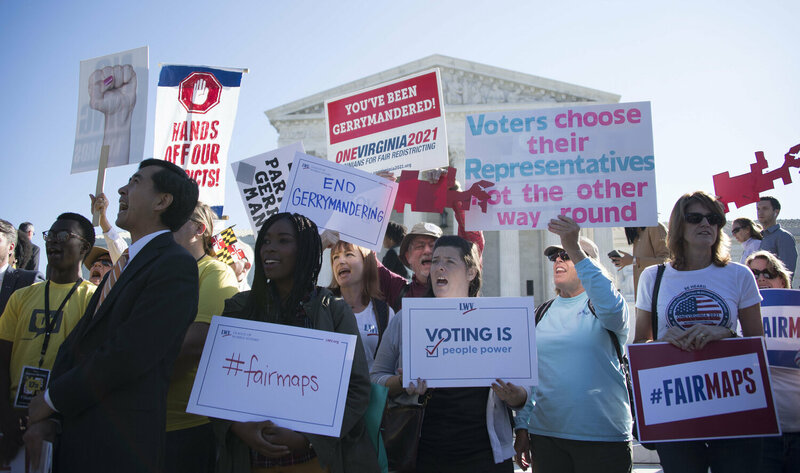 Demonstrators protest outside the Supreme Court on Tuesday as the court hears arguments about partisan gerrymandering. Chief Justice John Roberts warned Tuesday that the Supreme Court’s “status and integrity” could be jeopardized if a majority of the justices declare that there is a constitutional limit to partisan gerrymandering. At the same time, the court’s four liberal justices warned that failing to act poses a threat to democracy. With the court apparently split 4-4 along liberal-conservative lines, the man in the middle is Justice Anthony Kennedy, who in a 2004 court opinion left the door open to declaring extreme partisan gerrymandering unconstitutional if “manageable standards” could be developed for identifying which ones are extreme. The test case before the court is from Wisconsin. In 2011 Wisconsin Republicans completely controlled the redistricting process for the first time in four decades. A divided federal court later found that Republicans, using high-speed computer technology along with new voter data, were able to draw new district lines to solidify their control of the Legislature for at least the rest of the decade, if not longer. Indeed, a year after the redistricting, Republicans captured only a minority of the statewide vote — 48.6 percent — but, as they had privately predicted, they still won 60 of the 99 state legislative seats, while the Democrats, who had won a majority of the vote, captured a mere 39 seats. Inside the Supreme Court chamber, all eyes were on Kennedy. But he gave no hint as to his thinking, except that he did not seem inclined to derail the case on procedural grounds, a possibility that some of his fellow conservatives seemed quite interested in. While Justice Samuel Alito conceded that “gerrymandering is distasteful,” he disdained the idea of trying to find manageable standards. The court’s liberals, in contrast, focused on the question Kennedy first raised in 2004: manageable and fair standards for judges to use in determining which are the extreme partisan gerrymanders. Justice Stephen Breyer had a series of suggested steps: Limit judicial oversight to cases where one political party has complete control of the redistricting process and uses that advantage to draw district lines that, as in this case, give the incumbent party a statewide victory with a minority of votes or otherwise deeply entrench itself for years to come. In evaluating a partisan gerrymander, he suggested, judges should ask whether the plan is an outlier in terms of the way it treats one party as opposed to the other and whether there was a neutral motive for the way the district lines were drawn — for instance, to create districts of equal population, or to prevent breaking up counties or municipalities. Wisconsin Solicitor General Misha Tseytlin called Breyer’s suggestion “a nonstarter” that would end up as a “battle of experts” in the courts. So why didn’t they take one of the less gerrymandered maps? Sotomayor asked. Making the case for judicial oversight of partisan gerrymandering was lawyer Paul Smith, vice president of litigation and strategy at the Campaign Legal Center. But Chief Justice Roberts raised an institutional concern. “The main problem for me is [that if you prevail here], there will naturally be a lot of these claims raised around the country. … And every one of them will come here for a decision on the merits,” he said. Although the Wisconsin case was brought by Democrats, it has won support from many prominent Republicans, among them two former GOP presidential candidates, former Sen. Bob Dole of Kansas and Sen. John McCain of Arizona, as well as Arnold Schwarzenegger, who as governor of California pushed through an independent redistricting commission — something that is not permitted in most states, including Wisconsin. Former Gov. 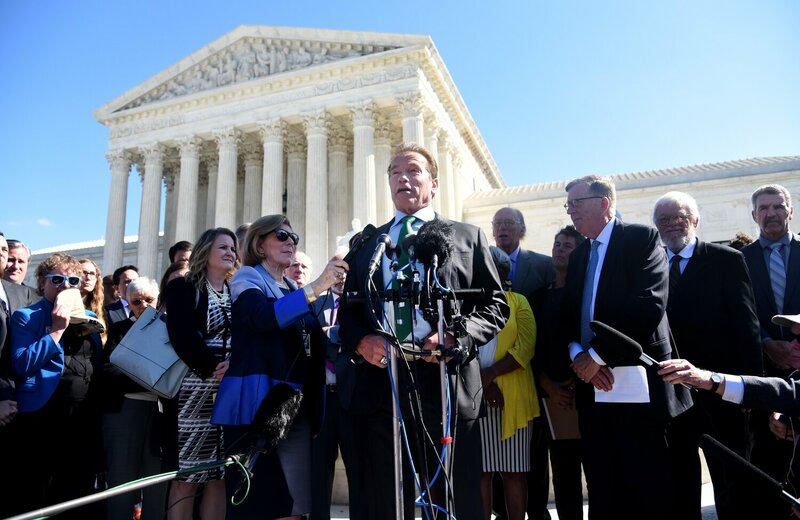 Arnold Schwarzenegger, R-Calif., speaks outside the Supreme Court against partisan gerrymandering.